Thank you! We just dropped a Geometry class at a local co-op because it was being taught out of Glencoe aligned with Common Core standards. The teacher was very good but even in week one she was scratching her head wondering why the textbook took 5 steps for a problem that could have been solved in one or two. We will stick with Chalk Dust for the rest of high school. I am thankful that our umbrella school recommended your company to us. I am one of those parents who has tried a LOT math curricula over the years. My daughter is math challenged, but scored in the top percentile of math on standardized testing this spring after completing Chalk Dust Algebra I. Thank you for all you do to help homeschoolers." Chalk Dust has been producing math courses high school and college level for many years. (You can read my comprehensive review of Chalk Dust here.) Courses are all taught by Dana Mosely, a very engaging and understandable math instructor. Chalk Dust courses are often used by colleges, but they are superb for homeschoolers looking for courses that are thorough and challenging but that don't require the parent to do the teaching. Chalk Dust Geometry in now in its fifth edition. 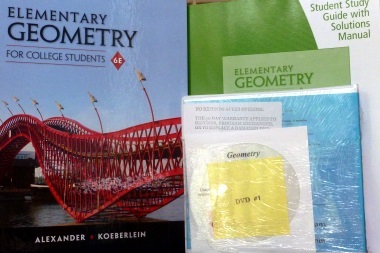 The course uses a Cengage Learning textbook, Elementary Geometry for College Students (Fifth Edition) by Daniel Alexander and Geralyn Koeberlein. Note that Mosely's DVD lessons for this course are listed among the Student and Instructor Resources in the preface to this textbook since the DVDs were created specifically for this text. Even though the text says it is for college students, the preface states: "This textbook has been written for many students: those who have never studied geometry, those who need a fresh approach, and those who need to look at geometry from a different perspective..." (p. ix). While the vocabulary and sentence structure of the text might be more sophisticated than that of some high school texts, the video presentations cover the same content that is presented in the text in a more accessible fashion that should be easily understood by high school students. Mosely assumes nothing, taking time to explain even basics such as terminology and how to use a protractor. Sometimes Mosely presents topics in a different order than the text, and he always uses his own method of explaining rather than mimicking the textbook. While instruction in the text is succinct, Mosely's lesson presentations expand greatly upon most topics as he uses a chalkboard to stress key points, demonstrate concepts, and work sample problems. The Chalk Dust Geometry course includes the textbook, a set of eight DVDs, and the Instructor's Solutions Manual. The course comes with stapled sheets that have additional instructions, technical tips, and assignments from problem sets. These include suggestions for adapting assignments to be more or less challenging according to the needs of each student. The DVDs follow the structure of the textbook. The text has ten chapters with each chapter divided into from three to seven sections. Each section has its own set of exercises. Each chapter concludes with a chapter summary that restates key points, a chapter overview with a chart showing key points with graphic images and formulas, review exercises, and a chapter test. At the back of the text is an answer key with selected answers to exercise problems, all answers to review exercises, full proofs for selected review exercises, and answers for all test problems. The Instructor's Solutions Manual has complete solutions for all exercise, review, and test problems. While the text is printed in full-color with many illustrations, the illustrations are purposeful-graphics to illustrate concepts comprising the large majority of them. Students should begin with the DVD presentation, watching it once for the basic concepts then again to stop and work out sample problems themselves to see if they have grasped them well enough to tackle the exercise problems. Mosely covers each topic in depth, but he sometimes moves at a rapid pace, and students will probably need to watch more than once to pick up everything. Students will then complete the specified exercise problems from the text - usually about half of the total number of problems. (The instruction sheet showing problem assignments marks in bold the problems that might be tackled by advanced students and skipped by others.) Students do not need to read the lesson in the textbook, although they can if they want to, and it will certainly reinforce the DVD lesson. While students should work about half of the chapter review problems, they should solve all of the end-of-chapter review problems since these provide cumulative review. The course content is similar to that of challenging high school level courses. In addition to all of the expected topics, the course thoroughly integrates algebra, includes an introduction to trigonometry, and has extensive work with the rectangular coordinate system and proofs. Two-column proofs are introduced early in the course, but the course teaches paragraph proofs and other less formal ways of "proving" a solution with a goal of trying to help students understand the logic involved as well as various ways of arriving at a solution. While students become familiar with postulates, theorems, and corollaries, they are not required to memorize them. Appendix B lists them all at the back of the book. Lots of real life applications are presented in the textbook, particularly in word problems. Each chapter has a "Perspective on History" feature that tells the story of a significant person or concept in geometry such as "The Value of pi" and "Sketch of Pythagoras." These are worth reading and students should find them interesting. Appendix A in the text has a 25-page "Algebra Review" that might be helpful for some students. Students will use a compass and straightedge to create constructions, and they will also use a protractor to measure angles. Occasional "Technology Exploration" activities in the text direct students to work with a graphing calculator or computer software (such as Geometer's Sketchpad). Even when the course teaches trigonometry, it doesn't require a graphing calculator or software. However, Mosely takes the time to explain calculator usage with an expectation that students will be using technological assistance at least in this final chapter. Although using a calculator isn't required, it does make some tasks much easier, and students continuing on with math need to be familiar with technological tools. As with other Chalk Dust courses, Chalk Dust Geometry is a well-tested, widely-used course that does an excellent job of teaching the subject matter. The course is easy for students to use for independent study, and if students get stuck, Dana Mosely will respond to their questions. Geometry is a set of 13 videotapes, ranging in length from about one hour to over two hours, and covering all of a typical high-school geometry course. Teacher Dana Mosely attemts to capture the student's attention right from the start by dedicating the first video to topics of student interest--optical illusions, shapes, congruence and similarity--before proceeding to the more mundane--introduction to coordinate and non-coordinate geometry, measurement, and how to make geometric constructions with the help of a ruler and compass. As in the other Chalk Dust math series, the silver-haired and energetic Mr. Mosely varies his time between addressing the student directly with vigorous word pictures and examples, and writing on and pointing to the blackboard. Lots of hand motions. Especially impressive: Mr. Mosely can draw a perfectly straight line freehand! His geometric drawings are neat and easy to understand, with no messy erasures. The remaining dozen videotapes cover geometric reasoning (patterns, structures, some basic rules about angles and segments, etc. ), lines in a plane, congruent triangles, circles, planar measurements (area and perimeter), space mesurements (volumes and surface areas), and loci (point equidistant from a given point). We only received the first two for review. These included not only classroom lectures and blackboard demonstrations, but some computer animations for illustrations. The optional reference text for this course is Geometry: an Integrated Approach by Larson, Boswell and Stiff published bt D.C. Heath in 1995. However, the course can be used with any standard high-school geometry text. "I have used your Algebra I and II as well as your Geometry tapes with great success. Your neighbor and delighted customer."